iTunes Home Sharing – This feature lets you get all the content directly to the device through WiFi. Airplay Improvement – When you hit on the Airplay icon, it looks around and then finds the Apple TV. And the same continues there, pretty easy. Personal hotspot – The feature to make the device act as a personal hotspot has been seen on the Android phones, but now the iOS 4.3 devices would be doing the same, as of now the iPhone 4 would be seeing that. Camera support for iPad – The iOS 4.3 comes in the iPad 2 supporting the rear and front cameras. The iPad 2 has Phone Booth just like the Mac, where the front camera can be used to capture pictures. Support to view 9 video streams at the same time. FaceTime – The app for Video conferencing in the iOS devices like iPhone and iPod touch, now would work with the iPad 2. 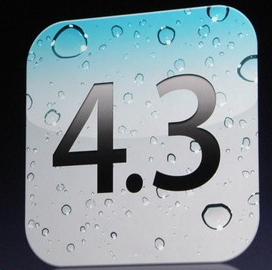 The iOS 4.3 would be coming out on March 11th, 2011 with support for iPad, iPhone, iPod Touch 3rd and 4th gen. It would be a normal update for the phones available when it is launched, but the iPhone users who have got it unlocked for other carriers should avoid it until they see any unlocking solution given by the iPhone developers. Check the iPad 2 Pricing, which is nothing different from the pricing of the first generation iPad.